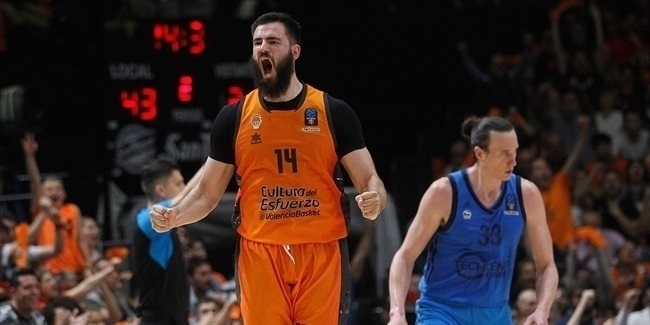 The 7DAYS EuroCup season took another step with the start of the Top 16. 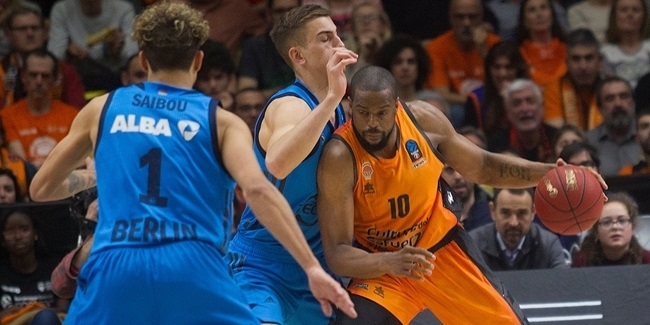 After eight games across the continent, Dustin Hogue of Dolomiti Energia Trento stood out among all other players to claim MVP honors this week. 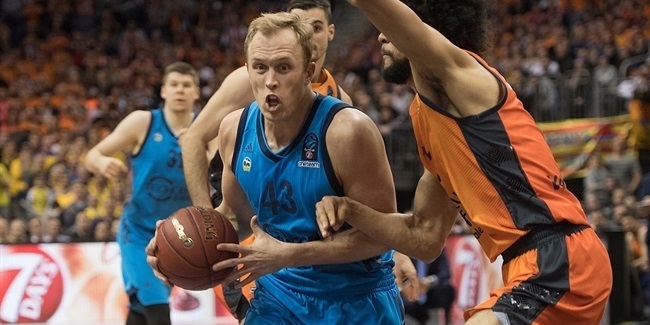 Hogue led his team to a 83-72 home win over Cedevita Zagreb to rack up a performance index rating of 40 in just his third EuroCup game ever. Hogue led Trento with 27 points - including 13 of 16 two-point shots -, 10 rebounds, 3 assists, 2 steals and 9 drawn fouls to round up his best performance yet in the competition. Second in line this week also comes from an Italian team as Amedeo Della Valle led Grissin Bon Reggio Emilia to a blowout win over Limoges CSP with a career-high PIR 38. Della Valle scored 22 points, pulled 9 rebounds (also a best mark for him), dished 4 assists and collected 3 steals for a great all-around performance. The top five individual performances of the round were completed by Darussafaka Istanbul's Jajuan Johnson (PIR 37), ALBA Berlin's Luke Sikma (PIR 35) and Zenit St Petersburg's Kyle Kuric (PIR 33). A sharpshooter like Kuric managed to hit a career record this round with his 30 points. Della Valle is, once again, the top scorer of the season with an average 19.1 points. Frank Elegar of Lokomotiv Kuban Krasnodar had a career best 14 rebounds to lead all players under the glass this week. Drew Gordon of Zenit leads those season rankings with an average 8.4. UNICS Kazan's Anton Ponkrashov was the only player in double digits for assists with his 11 decisive passes, while Chris Kramer of Lietuvos Rytas Vilnius is still at the top of the overall standings (7.0 apg.). In the defensive end, Diante Garrett of FIAT Turin topped the rankings with his 6 steals, while Pierria Henry of already eliminated Tofas Bursa still leads that category for the season (2.0 spg.). Finally, Stephane Lasme of UNICS (who else?) led all players in blocks this week with his 4 stops. He also leads the season rankings with a huge 2.6 blocks per game, the best figure since the 2007-08 season.